Floral dress is a knock-out! Great find. Thank you for the kind words, Peter! Great story, It was interesting to read about how you interacted with coleagues who knew you as a man. I think they recognized "me" despite how I was dressed. Fab outfit. You look great and good to hear the visit went well too. 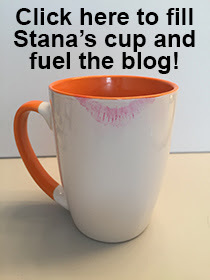 Thank you for Sharing Stana, but I couldn't help think. Ho hum! You've accomplished much, and this small aspect of your life, seems to be be the really you. As you seem to speak of it if you do it every day. What I found quite interesting was the dichotomy that you have trans-progressed, and the success you have achieved with out so much much as an ounce of concern by your associates. As if it was just a normal do lunch meet with business associates sort of day of a professional women. Congrats to your success! And a formation of what I believe to be true. Be true to yourself, and others will follow you. Thank you for your thoughts, Joan. I think I can attribute some of my success to the fact that I am the same person folks knew in boy mode. I changed my clothes, but I am still me.